We’ve identified 12 ad campaigns in which energy, insurance and other industries masked their sponsorship of political messages on Facebook. Yet there is no such company or organization as Energy4US, nor is it any entity’s registered trade name, according to a search of LexisNexis and other databases. Instead, Energy4US — which Facebook says spent nearly $20,000 on the ads — appears to be a front for American Fuel & Petrochemical Manufacturers, a trade association whose members include ExxonMobil, BP, Chevron and Shell. In 2015, when the Energy4US website was launched, it was registered to AFPM, which is also first on a list of “coalition members” on the site. AFPM, which did not respond to calls and emails for this article, has spent more than $2.5 million this year lobbying the federal government, including advocating for less stringent emission standards. Although Facebook now requires every political ad to “accurately represent the name of the entity or person responsible,” the social media giant acknowledges that it didn’t check whether Energy4US is actually responsible for the ad. 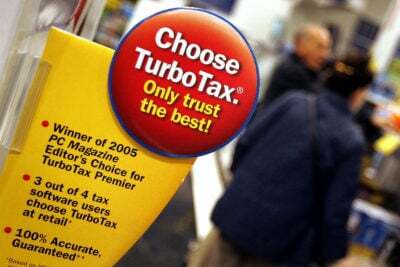 Nor did it question 11 other ad campaigns identified by ProPublica in which U.S. businesses or individuals masked their sponsorship through faux groups with public-spirited names. Some of these campaigns resembled a digital form of what is known as “astroturfing,” or hiding behind the mirage of a spontaneous grassroots movement. In most cases, Facebook users would have to click on the ad and scrutinize the affiliated website to find any reference to the actual sponsor. 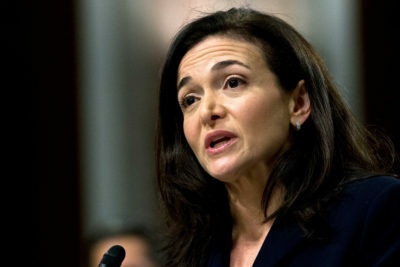 The 12 ad campaigns, for which Facebook received a total of more than $800,000, expose a significant gap in enforcement of its new disclosure policy, and they cast doubt on Chief Operating Officer Sheryl Sandberg’s assurance to the U.S. Senate in September that “you can see who paid for” ads. Adopted this past May in the wake of Russian interference in the 2016 presidential campaign, Facebook’s rules are designed to hinder foreign meddling in elections by verifying that individuals who run ads on its platform have a U.S. mailing address, governmental ID and a Social Security number. But, once this requirement has been met, Facebook doesn’t check whether the advertiser identified in the “paid for by” disclosure has any legal status, enabling U.S. businesses to promote their political agendas secretly. “Facebook and other social media platforms that allow political advertising must do more to provide transparency to Americans on the source of the content on their platforms,” U.S. Sen. Catherine Cortez Masto, a Nevada Democrat, told ProPublica. Rob Leathern, Facebook’s director of product management, said Facebook doesn’t try to verify the provenance of every political ad. The lack of a “reliable source to look and see every possible entity name that would be valid, including ‘doing business as’ names,” would make it a herculean task, he said. “We have to rely on the things that we can scalably look at.” Facebook primarily monitors disclaimers for profanity, names of hate groups and “vague or inaccurate” descriptions, as well as URLs (banned because they’re not official names), he said. “It’s pretty hard to prove a negative that something does not exist,” Leathern said. Facebook reviewed the ads identified by ProPublica, and they comply with the disclosure policy, he said. 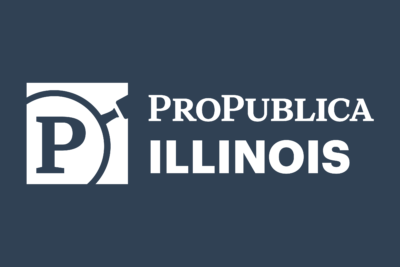 Leathern said that the new policy has improved advertiser transparency overall, and ProPublica did find some examples of enhanced disclosure. For example, a “Hoosier Country” campaign supporting U.S. Sen. Joe Donnelly, an Indiana Democrat, and criticizing his Republican opponent, has added a disclaimer that it’s paid for by Priorities USA Action — a liberal superPAC — and SMP, the “Senate Majority Project,” which is associated with Senate Minority Leader Chuck Schumer. Leathern also noted that Facebook’s disclosure policy applies to ads about political issues as well as candidates. By contrast, Google’s disclosure requirements only apply to ads about federal candidates or officeholders, according to its website. Issue-oriented ads on television also don’t require a disclaimer. Like Facebook, Twitter requires ads about political issues to carry a “paid for by” disclaimer. But unlike Facebook, under a policy that it began enforcing on Sept. 30, Twitter verifies advertisers’ names via their Employer Identification Numbers, making it harder for the actual sponsors to hide. For instance, ads from Energy In Depth carried a disclaimer on Twitter — but not on Facebook — that they were paid for by Independent Petroleum Association of America. Energy in Depth’s ads on Facebook criticized lawsuits against oil and natural gas companies over climate change. Seth Whitehead, a team lead with Energy in Depth, said that it complies fully with Facebook’s rules and that the group’s website discloses its role as an IPAA program. Including the Energy4US and Energy in Depth campaigns, seven of the 12 ads identified by ProPublica were linked to the energy industry. The American Petroleum Institute, a trade association that has spent more than $5 million this year on federal lobbying, accounted for three of them. Under Energy Citizens, a name that API began using in 2009 to organize an ostensible grassroots movement against limits on emissions linked to climate change, the institute spent $260,000 since this May on Facebook ads aimed at people interested in Donald Trump or Sean Hannity. The ads praised oil and gas production for protecting the environment and addressing climate change, supported the controversial Keystone XL pipeline and opposed a nuclear power plant “bailout” in Ohio. Under Energy Nation, API urged Facebook users to “Vote for energy. Vote for jobs.” Under Explore Offshore Coalition, it courted people interested in Trump with ads contending that offshore drilling benefits veterans and doesn’t affect tourism. Of the five ad campaigns unrelated to energy, three trace back to insurance, real estate and technology companies. For instance, Trenton Don’t Touch My Insurance ran ads against a New Jersey bill that would have made it easier for individuals to sue insurance companies. The logo of the Insurance Council of New Jersey appears at the bottom of Don’t Touch My Insurance’s website. She said the failure to include “Paid for by Insurance Council of New Jersey” on the Facebook ads was unintentional, adding, “We stand behind it.” Other ads related to the campaign that ran on platforms besides Facebook did say they were paid for by the Insurance Council of New Jersey. The businesses or individuals behind the other two campaigns — one by the Long Island Coalition for Healthy Lawn and Water opposing a proposed New York state ban on certain fertilizers, and one by Americans for Fair Courtrooms against bail reform in California — could not be traced. The groups didn’t respond to requests for comment via Facebook Messenger, and Facebook declined to say who was behind these ads. Other media outlets have also identified Facebook political ads that were less than transparent. The New York Times reported in October on ads in a Virginia congressional race that identified the funder only as “A freedom loving American Citizen exercising my natural law right, protected by the 1st Amendment and protected by the 2nd Amendment.” CNN found ads on Facebook from “Memes that are right” and “Crush Cruz” groups, without further identifying the sponsors. Kearns told ProPublica that these disclaimers violated Facebook’s rules. In response to ProPublica’s questions, two advertisers promised more disclosure. Connect Americans Now, which pushes for improved access to high-speed internet in rural areas, is a “Microsoft-supported community,” Zachary Cikanek, a Connect Americans Now spokesman, said. “In future ads we are going to go beyond what is required” and identify Microsoft’s role. 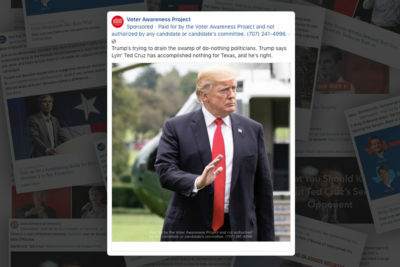 Names like “The Voter Awareness Project” and “Breaking News Texas” are being used by political groups for negative campaign ads on the platform. Wiles cited leaked documents from a proposed 1991 ad campaign sponsored in part by EEI. To avoid “lower overall credibility ratings” garnered by industry sources, the campaign would have created a group called “Information Council on the Environment” or “Informed Citizens for the Environment” to express skepticism about global warming. 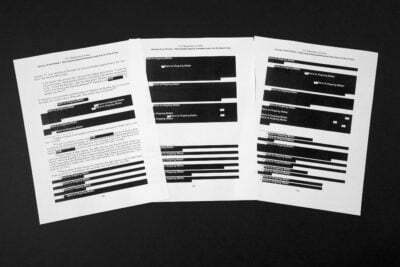 The messaging was tested in a few media markets and received critical press coverage, according to the documents. EEI did not respond to questions about this campaign. Several years ago, the “California Drivers Alliance” and “Fed Up at the Pump” —stand-ins for, respectively, the Western States Petroleum Association and the California Independent Oil Marketers Association, now rebranded the California Fuels & Convenience Alliance — ran ads on Facebook and elsewhere in an attempt to stop the scheduled implementation of climate regulations in California. Kara Siepmann, a WSPA spokeswoman, confirmed that it was behind the California Drivers Alliance campaign. WSPA is now running ads on Facebook under the name “Californians for Cost Containment,” warning that climate change restrictions could lead to higher fuel prices. “We agree that there needs to be transparency,” Siepmann said. 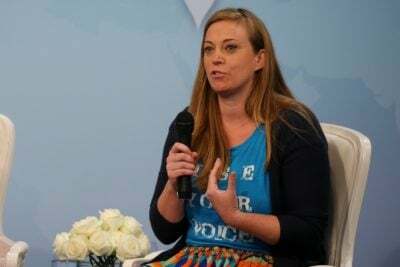 WSPA is “examining the updates the social platforms are making and ensuring that WSPA is remaining transparent around the communications campaigns that it’s running.” CFCA did not return requests for comment. Here are the examples found by ProPublica where Facebook has allowed advertisers to say their ads are “paid for by” a legally nonexistent group. Energy Citizens, Energy Nation and Explore Offshore Coalition, actually programs of the American Petroleum Institute. “We are in compliance with Facebook’s advertising rules,” API spokeswoman Natalia Sharova said. Energy4US, linked to American Fuel & Petrochemical Manufacturers. AFPM did not return requests for comment. Long Island Coalition for Healthy Lawn and Water, actual advertiser unknown. Did not respond to a request for comment via Facebook Messenger. Don’t Touch My Insurance is “just a name of a campaign” managed by the Insurance Council of New Jersey, said ICNJ president Christine O’Brien. Americans for Fair Courtrooms, actual advertiser unknown. Did not respond to a request for comment via Facebook messenger. Texans for Natural Gas is a “is a digital advocacy campaign,” said a spokesman, Steve Everley, “As clearly disclosed on our home page, Texans for Natural Gas receives support from three natural gas producers,” EnerVest, EOG Resources and XTO Energy. XTO Energy is a subsidiary of ExxonMobil. Connect Americans Now is a “Microsoft-supported community.” Connect Americans Now spokesman Zachary Cikanek said. 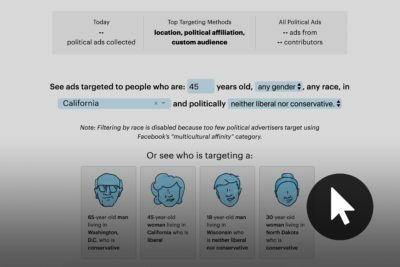 See how political advertisers target you. Use this database to search for political ads based on who was meant to see them. Jeremy B. Merrill is a news apps developer at ProPublica, concentrating mostly on Congress data and our Represent app.